There are right around 200 drug and alcohol rehab programs in Oklahoma. These facilities, which comprise both inpatient and outpatient centers, provide treatment for roughly 15,000 people on any given day. There are very few detox beds available in the state, and just under ten percent of all programs in Oklahoma are residential. Whether you’re searching for rehab help for yourself or someone else, we’re here to help. You can find local addiction treatment facilities in Oklahoma by clicking on a city below, or you can call us to speak with a rehab consultant to find out more about other inpatient drug and alcohol rehabilitation program options. 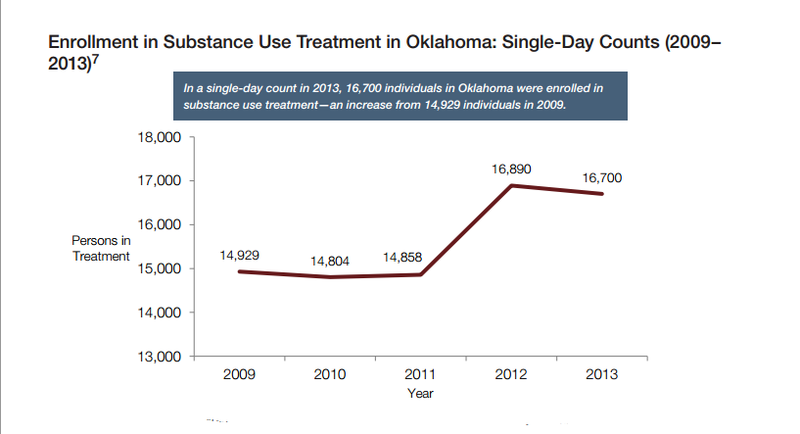 In a single-day count there were 16,700 people in Oklahoma enrolled in substance use treatment, which was an increase of less than 15,000 just a few years earlier. 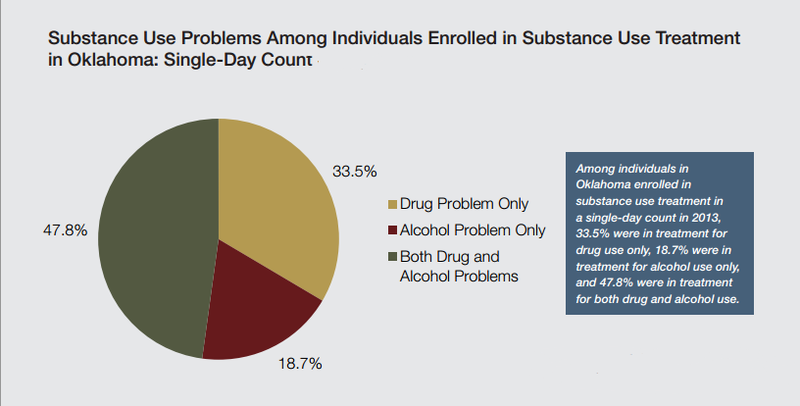 Among the people in Oklahoma enrolled in a drug or alcohol rehab in a single-day count, 33.5% were in treatment for drug use only, 18.7% were in treatment for alcohol use only, and 47.8% were in treatment for both drug and alcohol use. In Oklahoma, about 251,000 people aged 12 or older were dependent on or abused alcohol within the year prior to being surveyed, and about 76,000 people in the same age group were dependent on or abused illicit drugs during the same time period. About 159,000 adults aged 21 or older in Oklahoma reported heavy alcohol use within the month prior to being surveyed. Among people in Oklahoma aged 12 or older with alcohol dependence or abuse, about 19,000 individuals per year received treatment for their alcohol use within the year prior to being surveyed. use treatment, and 188 were receiving buprenorphine. Daily methadone users increased by more than a thousand in the past five years, while buprenorphine users jumped by more than 150. In Oklahoma, among people aged 12 or older with illicit drug dependence or abuse, about 11,000 individuals per year in received treatment for their illicit drug use within the year prior to being surveyed.